I used to make hummus from canned beans. Then I made hummus from garbanzo flour, but I didn't quite like the consistency. Now I make hummus from dried beans in 5 minutes. I cook 3 cups of dried garbanzo beans in my pressure cooker. I soak them overnight first. Change the water, add new water and a bit of oil. Then follow my pressure cooker's instructions for garbanzo beans. The cooking part takes around 20-30 minutes (build pressure, cook at high pressure about 15 minutes, let pressure dissipate naturally). I see what you are thinking. I am already way over 5 minutes. But here is where I get extra tricky. I immediately use 2 cups of cooked beans to make a batch of hummus. Then I put the rest of the beans in 2-cup portions (I use 2-cup Pyrex containers), and freeze them. Three cups dried garbanzo beans makes a little more than 8 cups cooked beans. Later, when that first batch of hummus is almost gone, I put a frozen 2-cup container of cooked garbanzo beans in the fridge overnight. The next day, those beans are all set to be made into a new batch of hummus. And making that hummus takes about 5 minutes. Blend all ingredients together in some kind of blender or food processor. I don't own a big food processor, so I just use the little attachment for my immersion blender. I often leave out the garlic and cayenne for my kids, as they give it a lot more kick. Some folks say warm garbanzo beans makes smoother hummus. Put the hummus you just made in the 2-cup container that contained the defrosted cooked garbanzo beans to save yourself a dirty dish. You'll have to eat a bit of the hummus to get the lid on, but that shouldn't be too hard, right? I've also heard of making hummus with raw soaked or sprouted garbanzo beans. The hummus guy at the farmer's market says this is how he makes hummus. Google "raw hummus" and you'll find plenty of recipes. Personally, I've never tried it. 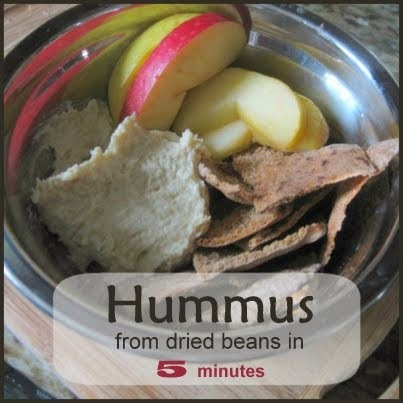 My kids like their hummus with pita chips or apple slices (see photo above). Stacy's pita chips are their favorite, but sometimes I buy whole wheat pita pockets and toast them myself in the toaster oven to make whole wheat pita chips. By making beans in bulk, and freezing in 2-cup portions, I have cooked beans at-the-ready without having to buy or use canned beans. Hooray! I think my friend Heidi taught me this trick. Of course you could also use the beans for soups, stews, tacos, and so on. I do this! I cook and freeze all kinds of beans then add handfuls to whatever I am cooking. I started doing this in order to avoid all the salt and extra ingredients in canned beans. I love doing this! And this reminds me that I am low on cooks beans. I have been using pint mason jars. If they are in the freezer too long, there is a touch of what looks like freezer burn on the top beans, but so far no affect on the taste. I do this as well and use kombu to help with the gas from the beans. I hear the best trick is to make the hummus from warm beans. Have you heard that as well? Yes, warm beans - I should add that to the post. I'll add one other thing I've heard but not confirmed as well. I'm trying this right now with raw sprouted garbanzos - do you think it'll work?